MANILA, Philippines - The official results, list of passers, top examinees and other important announcements for March 2018 Civil Service Exam - Pen and Paper Test (CSE-PPT) both for professional and subprofessional levels are released by the Civil Service Commission (CSC) within sixty (60) days after the eligibility examinations. 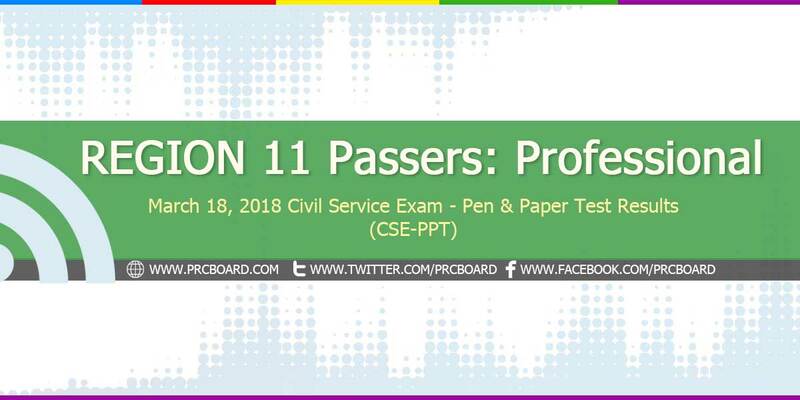 Below is the complete list of passers for March 2018 CSE-PPT Professional Level in Region 11 (Davao Region). Lord God! I awe it all to you. Thank you. To God be all the Glory! Looking for a positive result. Hoooooh! NAAAAAA... . !!!!!!! GOSH !!! DUGDUGDUGDUG ..
Oras oras nalang akong naka update dito wooo! IN GOD’S WILL PAPASA TAYO! pang ilan mo na ? Dili nako ka focus sakong trabaho. Goodluck to everyone! from CAREPOINT FAMILY! Praying for positive results.. Good luck!